Solar Heating - Rintoul's Leisurescapes - Above Ground, Inground Pool and Landscape ideas for Owen Sound, Port Elgin and surrounding areas. When considering a heat source for your pool, you only have to look up to realize the primary benefit of solar heat - it's free heat from the sun! With uncertainty and rising costs in the gas and power markets, the price for solar will not change. It will be free for life. Using your existing pump and filter, our easy-to-install solar pool heater ensures warmer pool temperatures, no monthly heating bills, and is proven to be the most cost effective way to heat your pool. Get the most out of your pool by extending the swimming season and have more fun--courtesy of the sun! Our solar pool heater is so versatile, it can be put anywhere the sun shines. The 'do-it-yourself' kit is easily installed on the roof of your home or pool change room, off the deck, beside the pool or on the ground. The most durable and longest lasting solar panels on the market, our Solarprene® rubber is completely resistant to pool chemicals, harsh U.V. rays, cold Canadian winters and the hottest Florida summers. 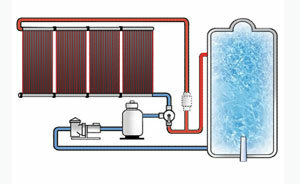 Pool water is pumped using your exisiting pool pump to the Enersol Solar Pool Heater panels. The sun's rays heat the water in the panels, then the heated water is returned to your pool. Enersol Solar Products Inc.'s exclusive '18 Year Extended Warranty' against defects in the solar collector panels, assures you many years of worry-free, low maintenance pool heating. When compared to natural gas or heat pump warranties, our solar warranty provides long term coverage and ultimately, peace of mind.